Add this end table to your living room for an effortless way to add style, organize belonging or show off decor. Storage is provided in the drawer while display space on the bottom is created by an open shelf. This table has an "X" design on the sides, turned wood feet and simple round hardware. The Vintage End Table with 1 Drawer and 1 Shelf by International Furniture Direct at Dinette Depot in the Brookfield, Danbury, Newington, Hartford, Connecticut area. Product availability may vary. Contact us for the most current availability on this product. Case Detail Turned legs and molding along tops and bottoms of pieces. Complete the look of your living room with this traditional style occasional set. These tables create a great place to store items, show off decor and put the finishing touches on your living room. 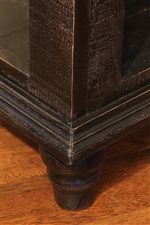 Style elements include a rubbed through dark finish and metal inlays with "X" designs on the sides. Choose between a cocktail, sofa, end or chair side table for the size and height you need. 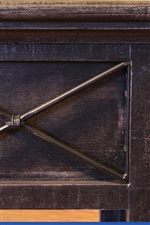 The Vintage collection is a great option if you are looking for Traditional furniture in the Brookfield, Danbury, Newington, Hartford, Connecticut area. Browse other items in the Vintage collection from Dinette Depot in the Brookfield, Danbury, Newington, Hartford, Connecticut area.